Little research investigates the role of patient–physician communication in understanding racial disparities in depression treatment. The objective of this study was to compare patient–physician communication patterns for African-American and white patients who have high levels of depressive symptoms. This is a cross-sectional study of primary care visits of 108 adult patients (46 white, 62 African American) who had depressive symptoms measured by the Medical Outcomes Study–Short Form (SF-12) Mental Component Summary Score and were receiving care from one of 54 physicians in urban community-based practices. Communication behaviors, obtained from coding of audiotapes, and physician perceptions of patients’ physical and emotional health status and stress levels were measured by post-visit surveys. African-American patients had fewer years of education and reported poorer physical health than whites. There were no racial differences in the level of depressive symptoms. Depression communication occurred in only 34% of visits. The average number of depression-related statements was much lower in the visits of African-American than white patients (10.8 vs. 38.4 statements, p = .02). African-American patients also experienced visits with less rapport building (20.7 vs. 29.7 statements, p = .009). 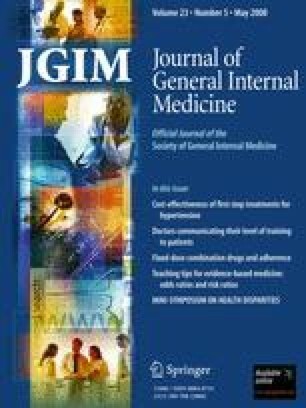 Physicians rated a higher percentage of African-American than white patients as being in poor or fair physical health (69% vs. 40%, p = .006), and even in visits where depression communication occurred, a lower percentage of African-American than white patients were considered by their physicians to have significant emotional distress (67% vs. 93%, p = .07). This study reveals racial disparities in communication among primary care patients with high levels of depressive symptoms. Physician communication skills training programs that emphasize recognition and rapport building may help reduce racial disparities in depression care. This paper was presented, in part, at the 15th NIMH International Conference on Mental Health Services, Washington DC, April 2, 2002 and the 25th Annual Meeting of the Society of General Internal Medicine, Atlanta, GA, May 3, 2002. This work was supported by grants from the Commonwealth Fund, the Aetna Managed Care and Research Forum, and the Agency for Healthcare Research and Quality (R01HS13645). The views expressed here are those of the authors and not necessarily those of the Commonwealth Fund, its directors, officers, or staff.